Off the heels of SuperPhillip Central's first Nintendo Switch review comes our first retail release Switch review. 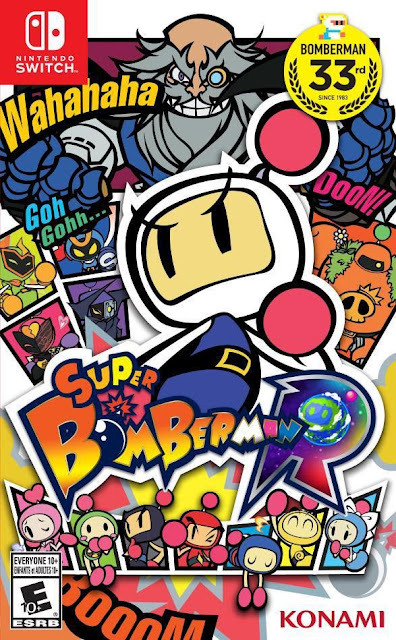 Now we explore the return of Bomberman with Super Bomberman R. While not a perfect return (far from it), this release did give me some joy along with a good deal of frustration. Here's SPC's review. Drops the bomb along with some duds as well. Bomberman has been in hibernation for quite some time. I took for granted how much I enjoyed the series when it was common for games starring old Bomby to release seemingly every other month. It is indeed true what they say: absence makes the heart grow fonder. 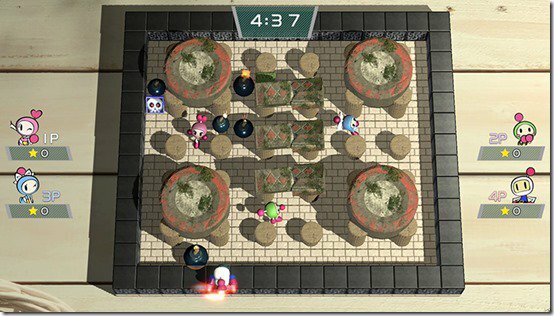 Now, Konami has brought Bomberman back and just in time for the Switch launch. Nonetheless, perhaps it being "just in time for the Switch launch" has made it a game that isn't as big of a blast as it could have been. 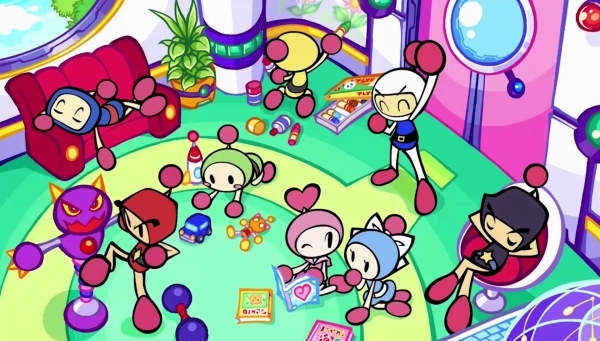 Super Bomberman R's story mode begins with an absolutely adorable scene that seems ripped straight from a Saturday morning cartoon with its cheesiness. It's intentionally campy, and it works in this regard. The voice acting is suitably campy as well, making for scenes throughout the game that you can't help but at least eek out a grin at. While not fully animated, these scenes and the dialogue that goes along with them are charming nonetheless. The actual campaign of story mode can be played by one's lonesome or locally with a friend. Though this can be more harmful than helpful; when you have two players each dropping bombs, sometimes even blowing one another up, especially in boss battles. Nonetheless, it's a nice option to be able to blow enemies to smithereens with somebody as long as you're not worried about having to continue, which costs a certain amount of money, the currency used to buy items in the in-game shop such as hats and characters to use in multiplayer as well as new arenas. In story mode you can bomb and blast alone or with a friend. The campaign tasks you with completing five planets of ten levels each. The first eight levels in each themed world contains various mission types, but most of the time it's simply to destroy all enemies, usually by trapping them with bombs. Other mission types include surviving an onslaught of enemies for a limited amount of time, stepping on a series of switches, gathering a specific amount of keys, and rounding up NPCs and bringing them to a goal area. This fourth planet of the campaign features plenty of slippery floors to slide along. The ninth and tenth levels in a world pits you against a two part boss, one of Buggler's Dastardly Bombers. The first of two battles puts you in an arena against a Dastardly Bomber, trying to outwit the boss. This is no easy task, as it seems the boss AI reads your control inputs and acts accordingly, something that makes multiplayer with AI an annoyance (more on that later). Still, I found it relatively easy to survive these encounters as I tried not to go all kamikaze on bosses. Instead, I picked my shots and tried to take each Dastardly Bomber out using the same strategy. When they dropped a bomb, I tried to drop a bomb a space away from that one, trying to trap the Bomber between the two bombs, thus resulting in them getting caught and trapped in the ensuing explosion. As you can imagine, with a co-op buddy, this becomes much trickier to do. The battle after, the tenth level, has the Dastardly Bomber transforming or entering some kind of machinery for a different kind of boss battle where learning patterns, picking one's shots, and discovering when a boss is vulnerable to attack are key to emerging victorious while losing the least amount of lives. One boss is a crab-like creature that requires you to avoid its swinging claw while blasting its six legs to bring the center of mech down to ground level, allowing you to deal damage to the boss. 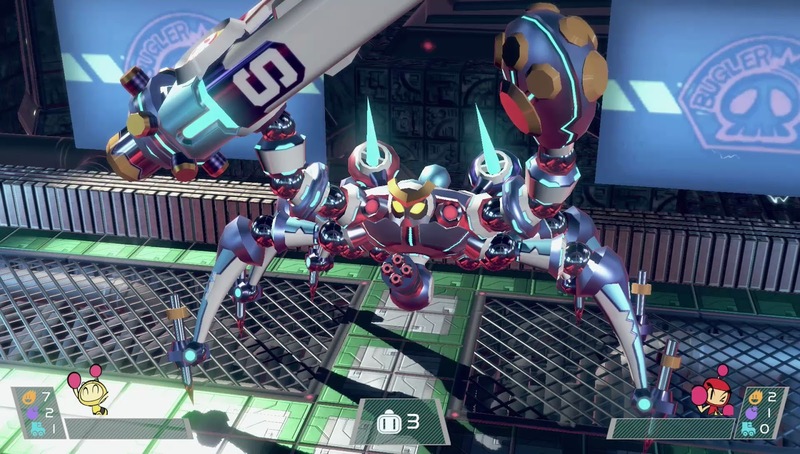 Magnet Bomber transforms into this most dastardly of mechanical crabs. The sixth world is unlike the other five, as it purely two boss battles against the big bad of Super Bomberman R's story. However, they're alike in that you're awarded up to three stars each for how well you do on the world, just like every other in the game. Collecting power-ups and not losing a lot of lives means you get a higher grade, and trying to get three stars on each world in each of three difficulties (higher difficulties mean smarter and faster AI as well as less lives to start out with) makes for some good replay value here. It's also a great way of earning money to buy goods in the in-game shop. Single player mode is overall not too bad, but it suffers from an atypical isometric camera view that can make it challenging to distinguish between different heights in levels and where enemies are. This is especially noticeable in levels with ramps, sometimes obscured by blocks and even the HUD. 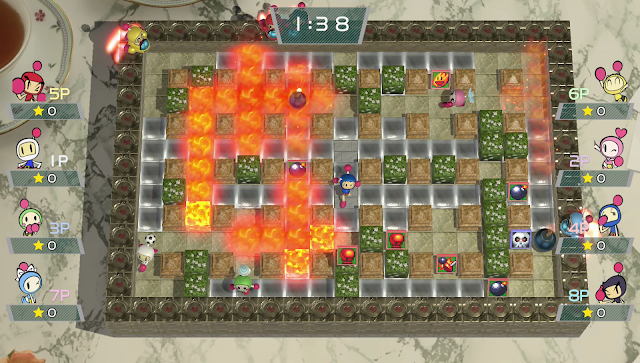 Thankfully, however, the control lag of this Switch Bomberman has since been patched by Konami, so one big problem of this mode and multiplayer has been remedied (though I would like to see grid-based movement added). While this level isn't too bad, others with varying elevations can be hard to distinguish between heights. Multiplayer is the other piece of Super Bomberman R and comes in the form of local and online play. Unfortunately, for a full-priced Bomberman game the lack of options available when customizing local matches is absolutely ridiculous and unforgivable. When a $10 Bomberman game released on the Xbox 360 almost a decade ago gives you the options to change AI difficulty and even switch out which item pickups are included and omitted in a match while a $50 Bomberman game doesn't, something is horribly wrong. The AI difficulty is of particular interest because including them battles makes for a completely unrewarding experience lacking much in the way of fun. The AI is simply too good, reading your control inputs and acting accordingly as if they can read your mind. Even Bomberman series masters will lose their cool to these computer-controlled bots from hell. 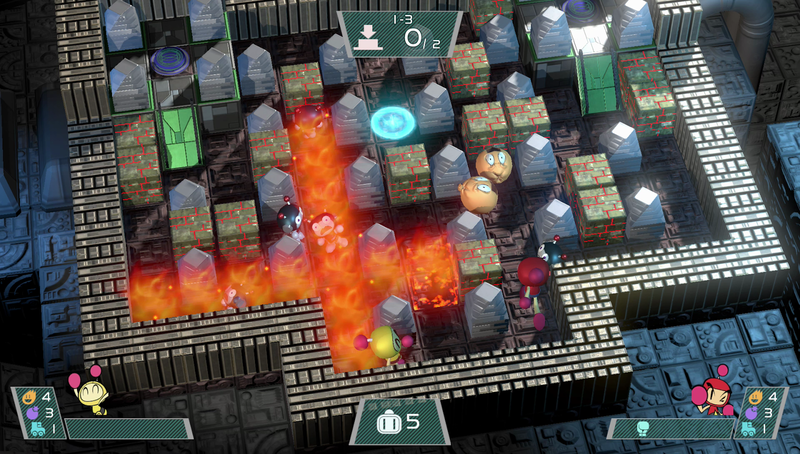 Up to eight players (either with controllers or with their own Switches) can unload bombs at one another locally. Online multiplayer has two types of matches available: casual matches with strangers and league battles. The former can have you and some local buddies join in while league battles are for one player only. League battles give winners and all participants money depending on their places in battle, and the winner gets ranking points. When enough ranking points have been earned, they move a rank to a higher class of players. Online isn't optimal, as it's player-based connections which can result in some particularly lag-filled battles. Beware: even defeated Bomberman can take you out via the Revenge Cart. 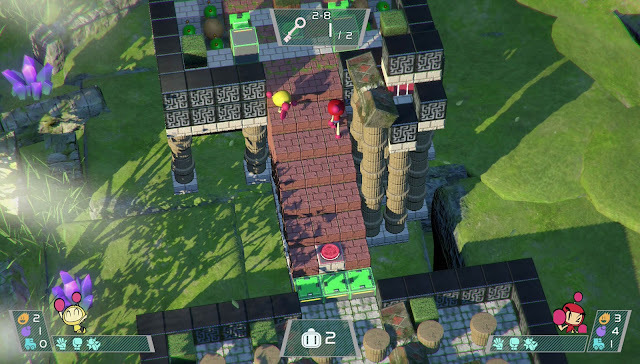 Super Bomberman R is a better game that what it started out with, and Konami has kept in touch with the community, starting that more updates are planned outside of their fix of the game's occasional input lag that seriously brought down the quality of the game. Still, I want to see the AI in multiplayer addressed as well as the ability to give players options in customizing multiplayer battles (even being able to earn money from local battles would do wonders for making that mode worthwhile to put up with the cheap AI). 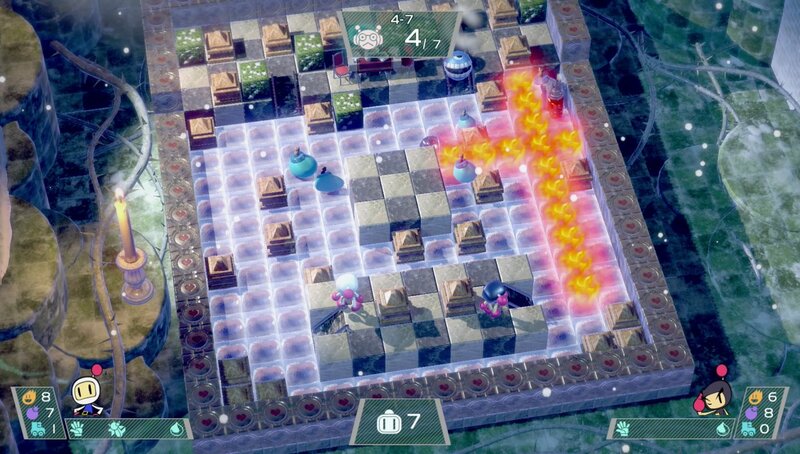 While Super Bomberman R isn't the absolute blast I wanted it to be, it's not a tremendous dud either. It's just average as of now.